Poke is one of the most healthy recipes in USA and part of Europe. 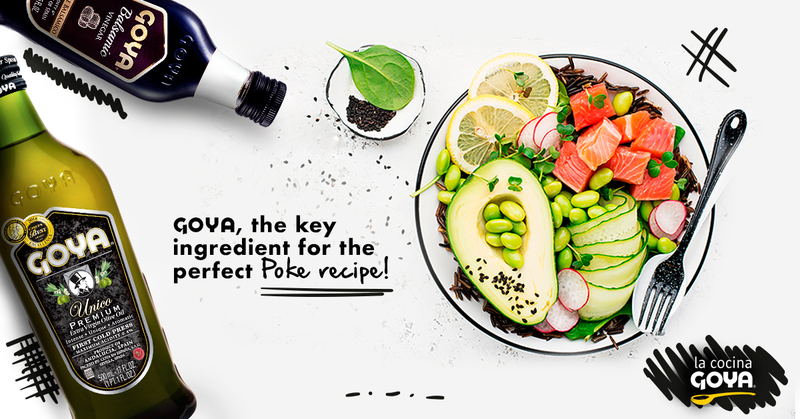 With hawaiian origin, to prepare a poke we will need crude fish, based on rice and complements like seaweed, avocado, cucumber, chives, fish roe, pickles… So we will have an ideal preparation to all tastes. Today we’ll cook salmon poke! Do yo dare? 3 tablespoons of Unico extra virgin olive oil. ½ teaspoon black sesame seeds. Add the rice to a fine mesh strainer and submerge in a bowl filled with water. Shake it a few times to remove excess starch. Fluff the rice with a fork or rice paddle. Transfer it to a large bowl. Mix together the vinegar, olive oil, sugar, and salt and pour over the rice while still hot. Gently fold the rice to incorporate. Cover and set aside until ready to assemble the bowl. Using a very sharp knife, gently slice the salmon fillet into ½-inch cubes. It may be easier to slice if you place the salmon in the freezer for a few minutes to help it firm up. To assemble, place a few spoonfuls of rice into a medium bowl. Top the rice with the seasoned salmon, avocado, cucumber, ginger, green onions, nori sheets, toasted sesame seeds, and black sesame seeds.